Notes: 1 Significantly higher than normal weight (p < 0.05). 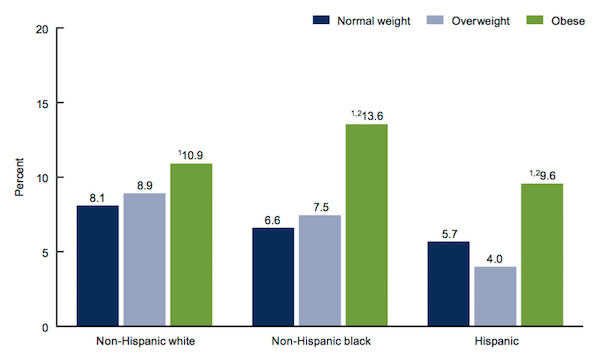 2 Significantly higher than overweight (p < 0.05). Among adults 20 years of age and over. Age adjusted by the direct method to the 2000 U.S. Census population using age groups 20–39, 40–59, and 60 and over. Data Source: CDC/NCHS, National Health and Nutrition Examination Survey, 2011–2014. This entry was posted in Medicine and Society Data Watch on March 23, 2016 by Genevra Pittman.